During the second workshop week we installed 2 temperature sensors and a humidity sensor in the middle topbars of the brood chamber. 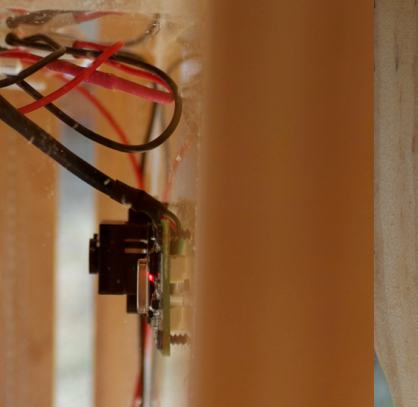 There is also a combined temperature/humidity sensor hanging at the backside of the hive. 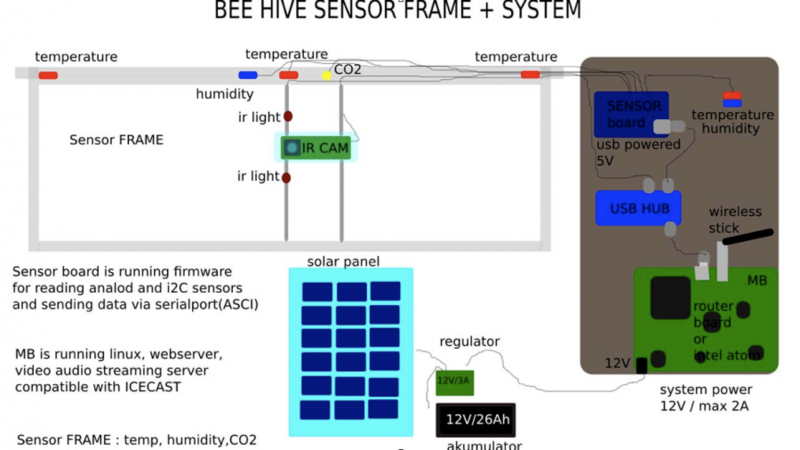 The design of the bee monitoring system is able to log temperature and humidity inside the hive brood nest and measure temperature and humidity in the rooftop garden outside the hive. 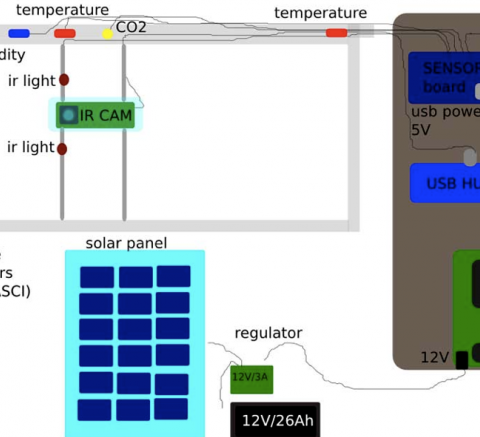 All the sensors are connected to an arduino board, which is connected to the internet. With this set up I can follow at any time the warming up and cooling down in the hive. 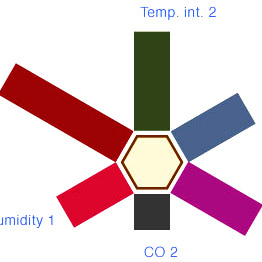 Temperature and humidity inside and outside the hive are important indicators of hive health. Some worker bees have a role as ‘heater bees’. They can dislocate their wings from their flight muscles and shiver with those large flight muscles to generate heat. These heater bees are easily identified in images taken by heat sensitive cameras because the temperature of their thorax can reach over 42°C degrees, contrasting with the normal temperature of the brood nest of 35 degrees Celsius. Even when the temperature outside is below freezing, the center of the hive can be 33 degrees. If the outside temperature falls below 12°C, bees cannot fly and they will be confined to the hive. If the bees either run out of honey or it is so cold that they cannot crawl from the edge of their warm cluster to the honey (below 10 degrees C, they cannot move), they will starve or freeze. This happened with our first beehive in 2009: a colony of native black bees (with pedigree) did not survive the harsh winter because their food sources were too far away from the bee nucleus. Too far was only 3 frames – but in a very cold winter every centimeter counts. Cooling in the hot summer is just as important. Wax softens if the hive temperature exceeds 35°C. Besides structural problems, this negatively impacts vibration-based communication between bees inside the dark hive. To cool down the hive the water-bees collect water and spread it over the comb. Bees also evaporate heat by mechanically creating air currents inside the hive to cool it down. Fanning bees at the entrance of the hive are performing this task. Humidity inside and outside the hive can influence how quickly the water in nectar is evaporated and transformed into honey. The bees try to maintain an average humidity value of 60% inside. The degree of humidity may also indicate environments that favor fungal growths that can devastate hives. This happens mostly in humid winters – (see chalkbrood). Graph representing the humidity values in the green monitored beehive over the season 2011-2012. In the beginning of the graph there is some noise, but from october 2011 we see clearly that the bees maintian a rather constant value of humidity around 55%, there where the outside values are [onderhevig aan] much bigger changes. Graph representing the temperature values in the green monitored beehive over the season 2011-2012. There are 2 temperature sensors installed left and right in the same topbar. The highest sensor values are closest to the honeycomb building and to the bee nucleus in winter. This entry was posted in bee monitoring technology and tagged bee monitoring, ict, media ecology, okno on 11/05/2012 by admin. 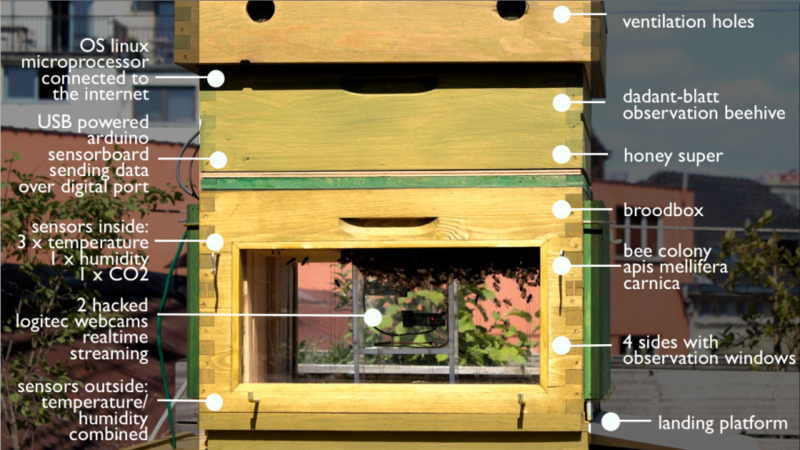 The enhanced beehive is a gateway to monitor a honeybee colony and its environment. Numerous possibilities for observing the bees’ behavior and important measured values from within the hive are provided as well as measuring data for the climate, soil, and vegetation in the honeybee colony’s direct environment. Storing all of the data over a period of several months allows not alone a very well detailed observation but also the ability to discover and follow long-term trends of complex relations between the superorganism and its environment. The life in and around the hive is monitored by many measurement systems. Two webcams , equipped with infrared leds, make it possible to see in the dark. The monitor the movement of bees over the frames in the hive. Since the hive was populated with a swarm (may 4th 2011), the 2 webcams record at 15 fps the life in the hive. Comb building, movements and action. 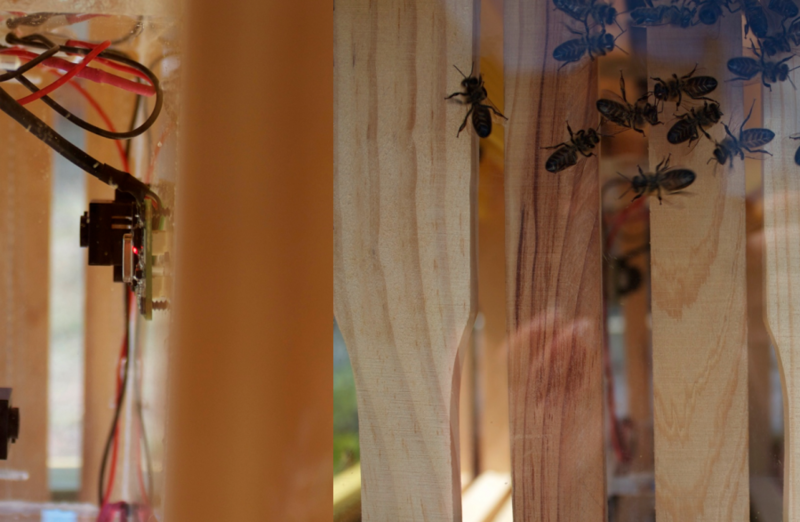 In the top of the frames (in the hive body) there are 2 temperature sensors capturing the temperature in the beehive, as well as a CO2 sensor and a sensor recording the humidity in the hive. The webcams are connected to a PC board that is configured as a streaming server. It makes the images of the hive in real time available on the internet. The data from the different sensors are also logged and available in realtime. Bee Monitoring Research in the OpenGreens. We organise a series of workshops to develop non-intrusive bee monitoring systems. 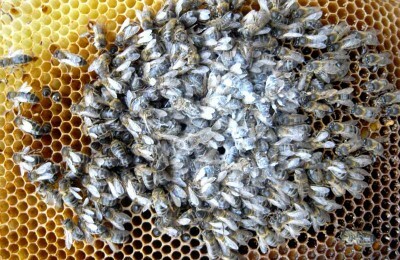 A swarm was put into the hive on may 4th 2011. Since than 2 webcams record the colonies’ behaviour. Simultaneously the data of inside and outside temperature, humidity and Co2 level are logged. This entry was posted in bee monitoring technology, biosensors and tagged bee monitoring, ict, okno on 18/02/2011 by admin.